Not on its own, of course – I find it too tangy for that. But mixed with something else, and tarted up (so to speak) nicely, it’s a joyous fruit to look forward to each year. It has the most wonderful hue, too – so rosy and infused with spring-time potential. The first rhubarb of the southern German season was on sale at the local market yesterday. What, I wondered, could Mrs Beeton advise me to do with it? INGREDIENTS – To every lb. 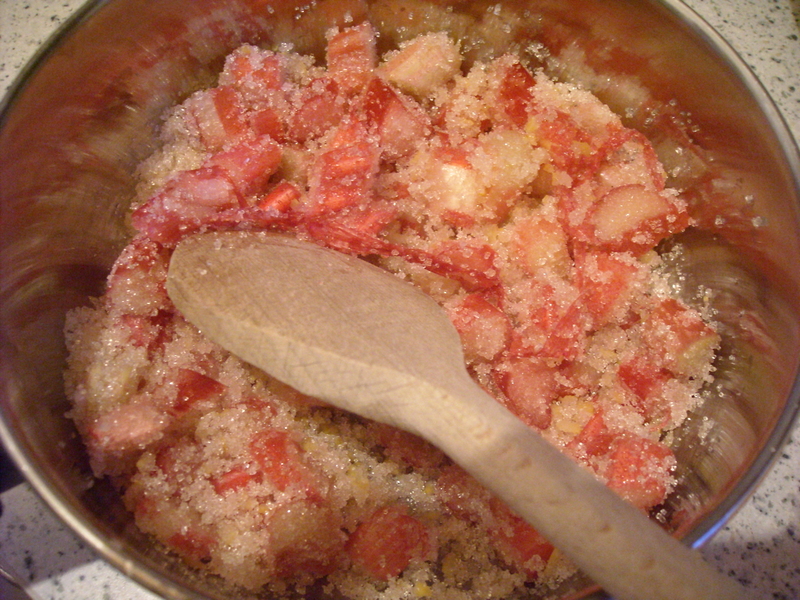 of rhubarb allow 1 lb. of loaf sugar, the rind of 1/2 lemon. 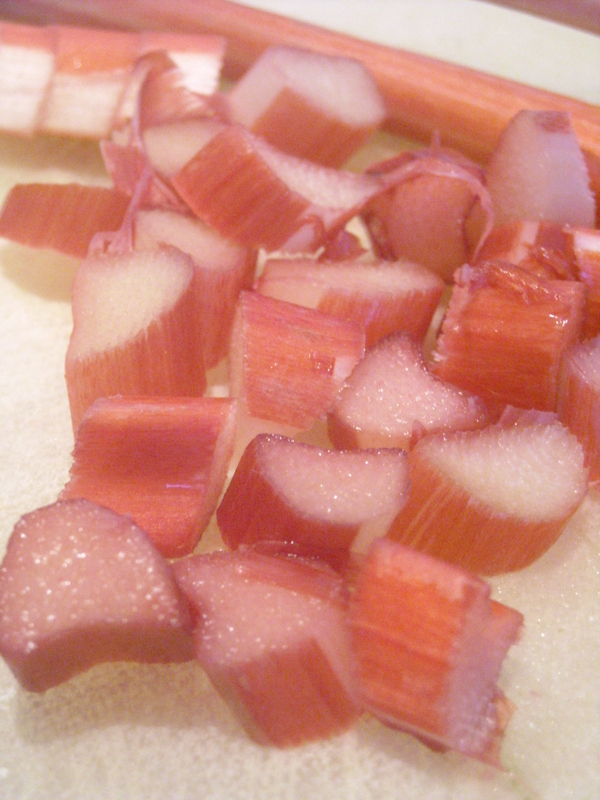 I only used two medium stalks, because I didn’t want to risk using it up on a recipe that might not taste appealing (I’ve never tried, or thought of making, rhubarb jam before). Unfortunately, I don’t have a grater fine enough to zest a lemon, so I did it the old-fashioned way – by peeling it off with a knife, then cutting it as finely as I could. Luckily, this jam is a cinch to make. 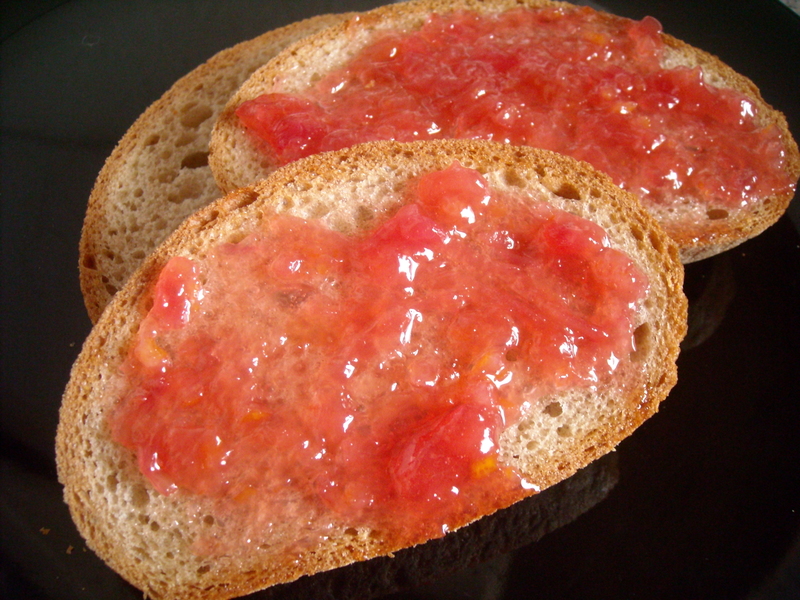 Within 45 minutes I had myself a small quantity of watermelon-hued jam, slightly tangy and tart, but wonderfully, refreshingly tasty. Don’t you just love spring and the miracle of produce she brings? “So, what do you think?” I asked my (‘I’m not fussy, I just have simple tastes’) boyfriend, as I handed him a slice. There’s always a moment of uncertainty when I give him new things to try. He isn’t, as stated before, a culinary adventurer – preferring, instead, to stick with the familiar climes of fries, schnitzel and chocolate wherever and whenever possible. He took a few bites and chomped away thoughtfully. “Hey, what do you think?” I prompted him again, giving him a small punch on the arm. I really liked it, too. 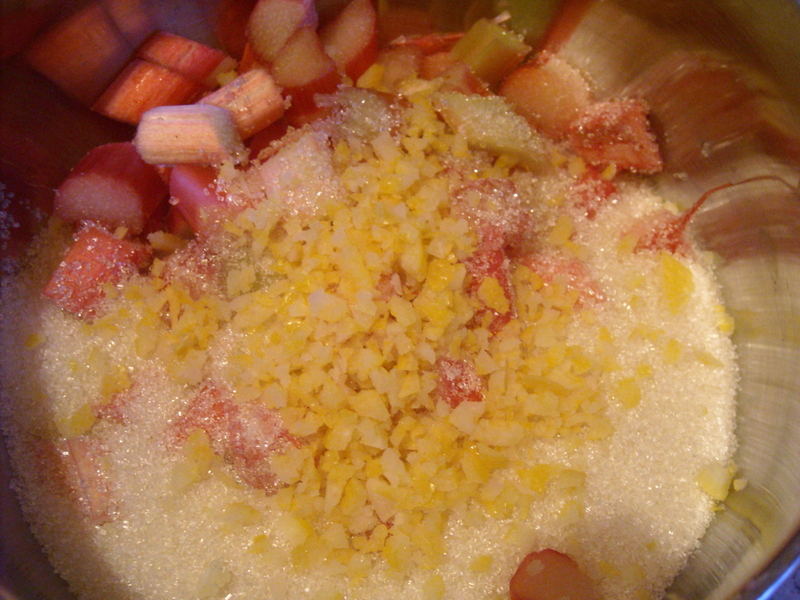 It takes little time or effort to prepare and once the sugar mix has liquified, it can be left to get on with its simmering with only an occasional stir. It’s not too tangy, either – the amount of sugar (plus the lemon) manage to balance out the tartness quite nicely. This entry was posted on April 4, 2010 at 12:06 pm and is filed under food. You can follow any responses to this entry through the RSS 2.0 feed. You can leave a response, or trackback from your own site.